TORONTO (Apr. 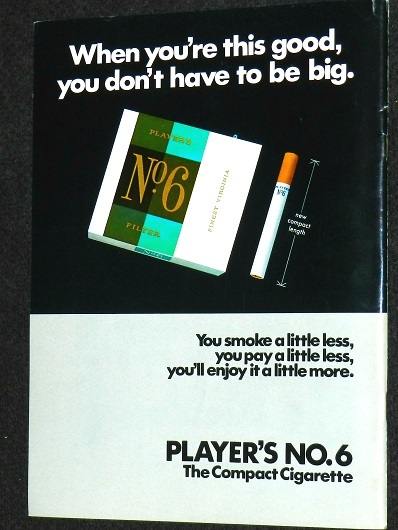 6) — When Brian Burke questions Nazem Kadri, you have no choice but to pay attention. In his role as president and general manager of the Toronto Maple Leafs, Burke chose Kadri seventh overall (from the London Knights) in the 2009 National Hockey League draft. Nearly a decade of hindsight proves that Burke was bang–on with the selection; in my view, only Mattias Ekholm, chosen 102nd by Nashville, might have been a better pick… and only because Ekholm is a defenseman. But, even Burke — while speaking with Bob McCown and Stephen Brunt on Prime Time Sports this week — felt “something is wrong” with the center–man that scored 32 goals for Toronto in 2016–17 and 2017–18. Kadri has slipped to half that total, 16 goals, in 72 games this season. In all fairness, however, who couldn’t have forecast that Nazem’s production would decline after being relegated to third–line pivot behind Auston Matthews and John Tavares? It came as no surprise to me. Way back on Oct. 20, I wrote a blog here entitled KADRI IN A TOUGH SPOT (http://bit.ly/2q45E7E), suggesting his numbers would clearly depreciate with the change in role. 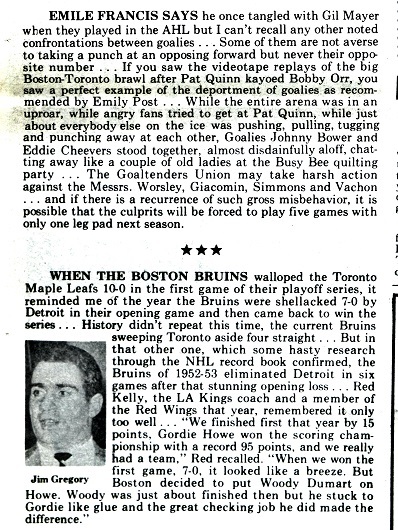 Though Burke has forgotten more about hockey than I’ll ever know, I respectfully disagree with him. I see nothing “wrong” with Kadri other than him no–longer sharing the No. 1 and 2 center–ice function with the Leafs. If the diminished responsibility, alone, wasn’t enough to stymie his production, the psychological consequence of being dropped in the pecking order surely exacted a toll. Kadri is an emotional player and has always reveled in handling important minutes to prove he can play “larger” than his size (liberally listed at 6-feet, 192 pounds by the Leafs). On a generally soft and passive team, Kadri has often shouldered the physical burden by himself. 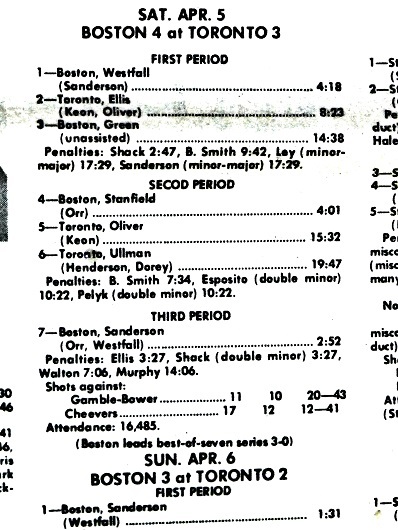 And, rather effectively, save for the odd moments when he lost composure and incurred league discipline. 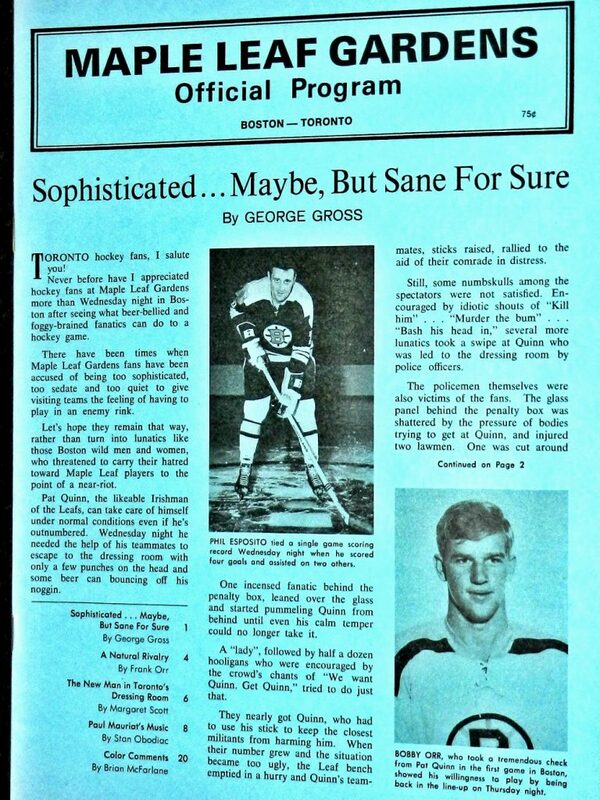 Under no circumstance would he be a third–line center on more than half the clubs in the NHL. 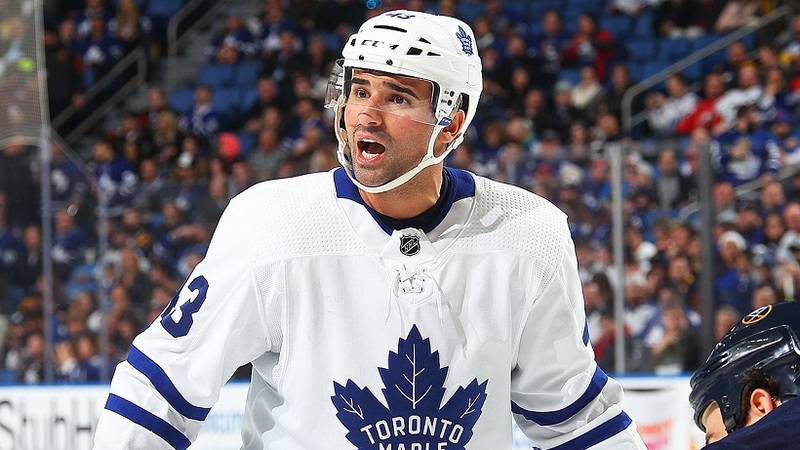 Which brings me to an intriguing two–part question: Might the Leafs venture to trade Kadri this summer for balance elsewhere on the roster? And, would Kadri — in possession of a modified no–trade clause — supply the Maple Leafs with the requisite list of 10 clubs to which he’d refuse a transfer? From my perspective, the latter is more conceivable. Kadri is under contract for three more years at a cap–friendly $4.5 million per season. That’s quite a bonus on a team with four players (Matthews, Tavares, William Nylander and Mitch Marner) about to consume nearly $40 million in cap space. On the flip side, the center–rich Leafs are going to need a defenseman to replace Jake Gardiner. Not just a “body”, but a player with near–commensurate ability. Nazem would be an enticing addition for any number of teams with a scoring dilemma (take your pick: New Jersey, Buffalo, New York Rangers, Arizona, Minnesota, Anaheim, Los Angeles). Having twice hit for more than 30 goals, Kadri could become the focal point of a trade to shore up the back end. I suspect he’d welcome both a change of locale and increased offensive liability. Either of Josh Manson (Anaheim) or Jared Spurgeon (Minnesota) would fill the gap created by Gardiner’s near–certain exit as an unrestricted free agent. Manson, 27, is a right–shooting defenseman under contract at $4.1 million for three more years. Spurgeon, 29, is also a right shot with one year left at $5.25 million. He’s had a nice season for the Wild (14 goals and 49 points). Like Kadri, Spurgeon possesses a modified NTC. Ol’ Naz has been a good soldier for the Leafs. If he wants out of town, there are deals to be made. KYLE WAVES THE FLAG: Rookie players make mistakes and so do rookie GM’s. It likely required a deep breath and a dose of humility for Kyle Dubas to abandon the Garret Sparks experiment. 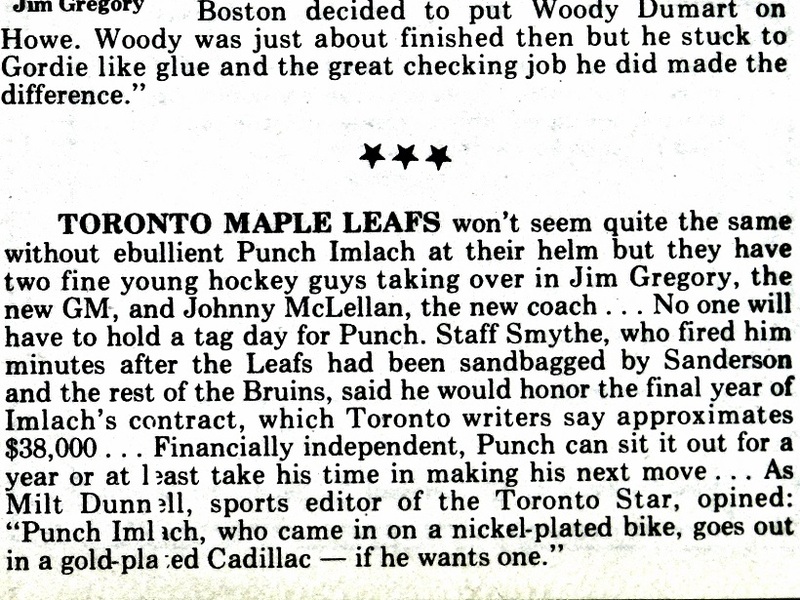 Though Dubas also acquired Michael Hutchinson, recalled on Friday to replace Sparks as back–up to Frederik Andersen, moving out the goalie he insisted upon last October — at the expense of Curtis McElhinney — was surely a difficult swallow. 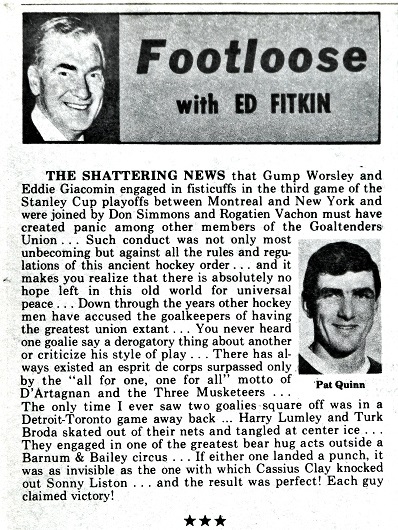 The Maple Leafs colored the swap as providing Sparks “every opportunity to regain his form”, but everyone knows the club could not enter the playoffs with a struggling, still–unproven goalie in the No. 2 slot. Neither is Hutchinson the second–coming of Patrick Roy, but he does have 111 games of NHL experience (mostly with Winnipeg) and he’s been effective with the Marlies this year (14–5–1 in 23 starts; 2.70 GAA). Hearts skipped a beat at practice on Friday when Andersen took a shot in the nether regions. He went down like a rock but returned after some heat and comfort. Nor was he singing soprano afterward. 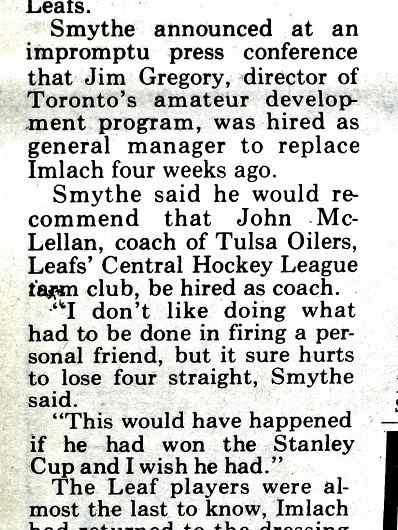 The Stanley Cup quarterfinal series that began with Bobby Orr getting knocked cold by Pat Quinn ended with Maple Leafs general manager and coach George (Punch) Imlach being fired by club president Stafford Smythe. 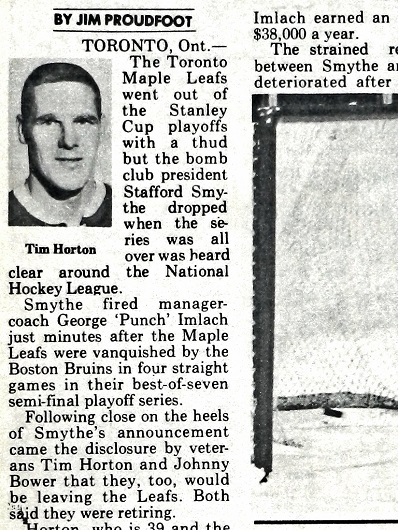 Moments after the Boston Bruins finished a four–game sweep at Maple Leaf Gardens, 50 years ago tonight, Smythe (son of Leafs founder Conn Smythe) marched into Imlach’s office and delivered the news. 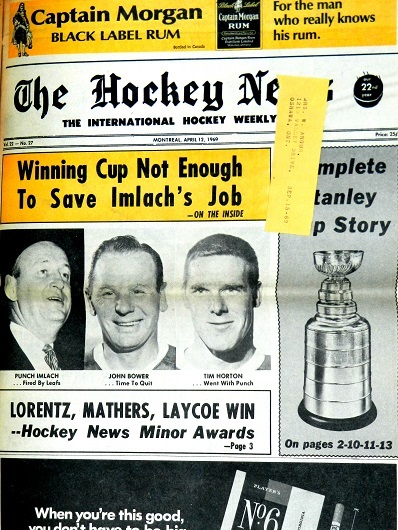 “This is the end of the Imlach era — he’s all through,” Smythe told reporters, somewhat callously, given that Imlach had guided the Maple Leafs to four Stanley Cup titles in the 60’s. It was front–page news the following day (Monday, Apr. 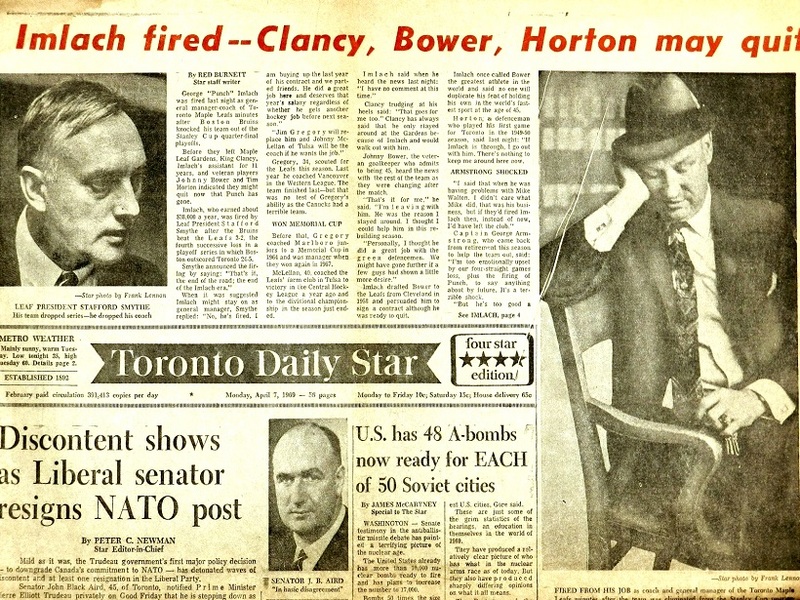 7, 1969) in the Toronto Star (above) and the old Toronto Telegram (below). 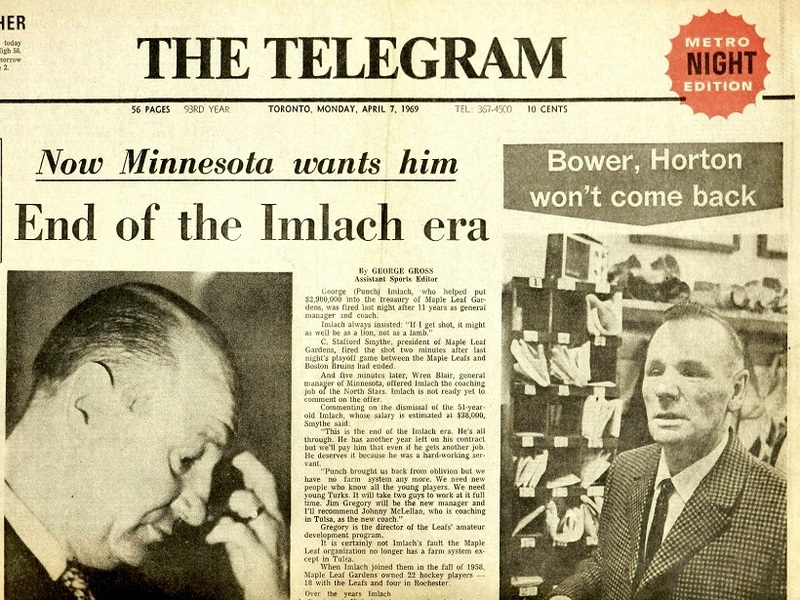 Though Imlach stalwarts Johnny Bower, Tim Horton and Frank (King) Clancy threatened to leave with him, all returned the following season. 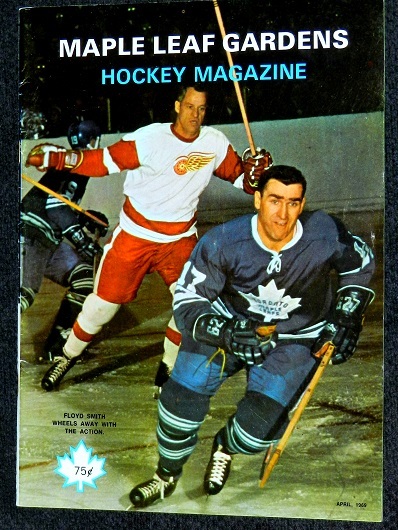 Bower retired in December 1969; Horton was traded to the New York Rangers in March 1970 and Clancy remained with the Maple Leafs until his death in November 1986. 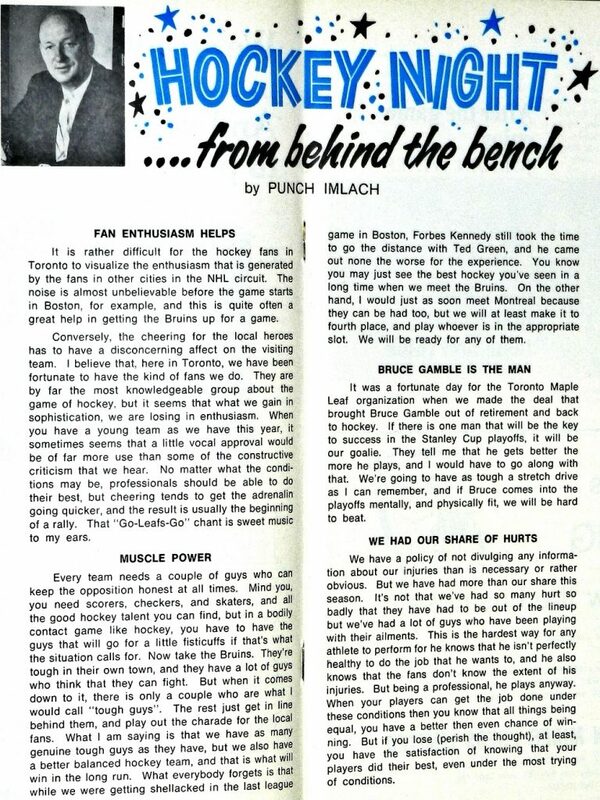 Imlach’s final column (above and below) for the Gardens program. 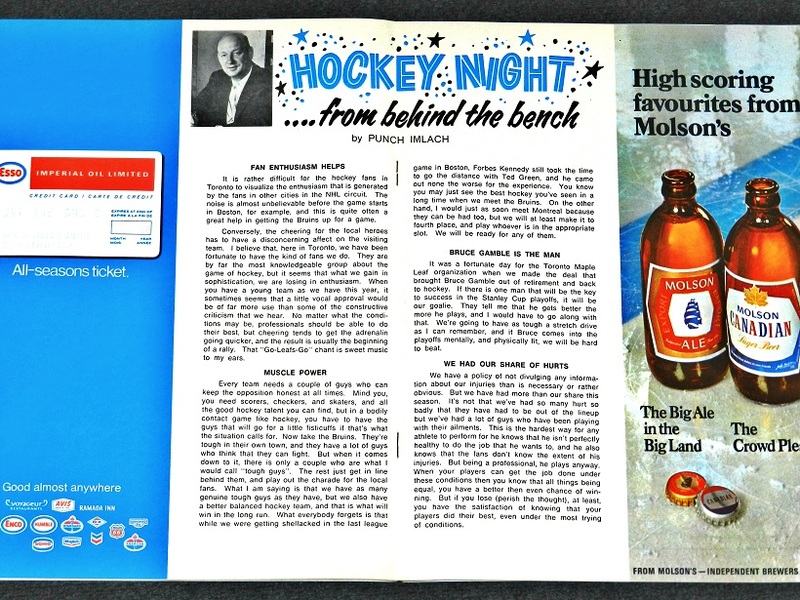 Cover–story (above and below) from the program–insert by George Gross of the Telegram. Bernie crossed out the name of Forbes Kennedy (No. 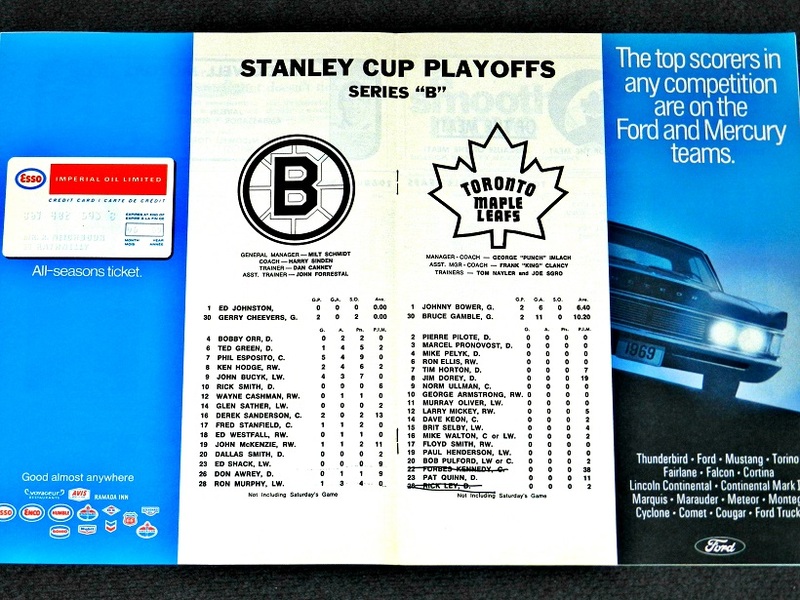 22) from the Leafs line–up (above). 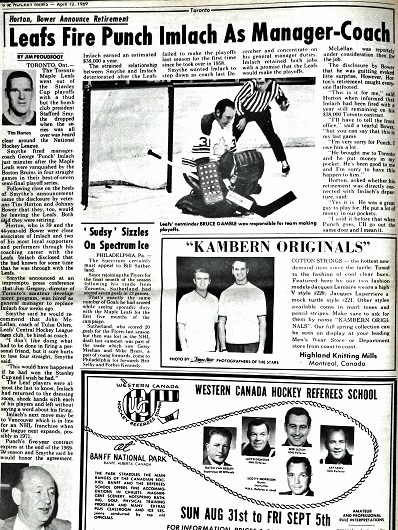 Kennedy had been suspended by NHL president Clarence Campbell for punching linesman George Ashley during a wild, bench–emptying brawl in the third period of Game 1. 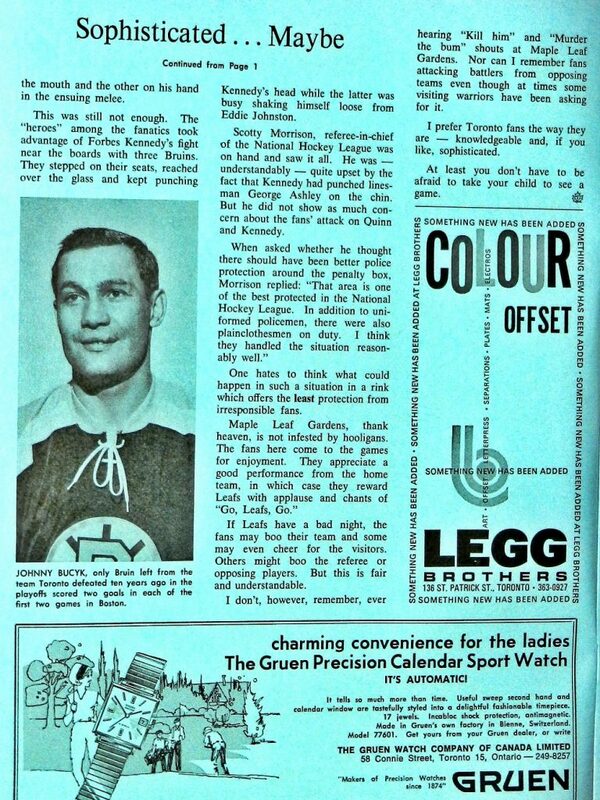 Forbes never played another game in the NHL. Rookie defenseman Rick Ley (No. 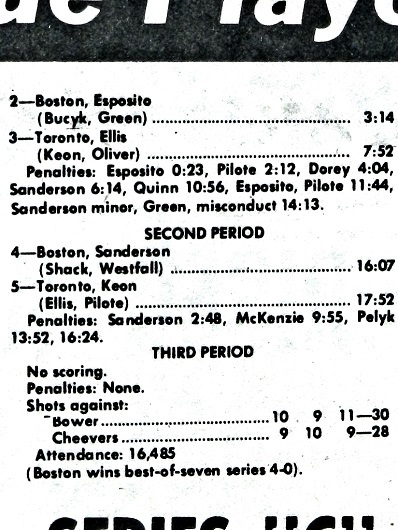 26) was also scratched from the line–up by Imlach.